Two more quilts made from Mark’s shirts are finally finished, and only because I had help. My friend Beth Hartford quilted them on her brand new longarm. And then it took me 4 months to bind them! This makes five quilts all together in tribute do my friend. You can see the others here. Mark’s Mom gets these two and I have just one more to complete, a quilt made from his T-shirts. This quilt is called “Shirt Tails.” I’m pretty sure you can see the tails in between the Nine Patches. I have really enjoyed making these quilts, touching the fabric, hoping that they are a comfort to his mother. I photograph large quilts outside so I get more even light. I pin the quilt to 4′ x 8″ Celotex insulation boards covered in fabric. I have a rack outside that I can Velcro the boards to, but I still need help holding them against the wind. They take off pretty fast. That’s Debbie on the right, and Scooter is also helping on the left (not so much). 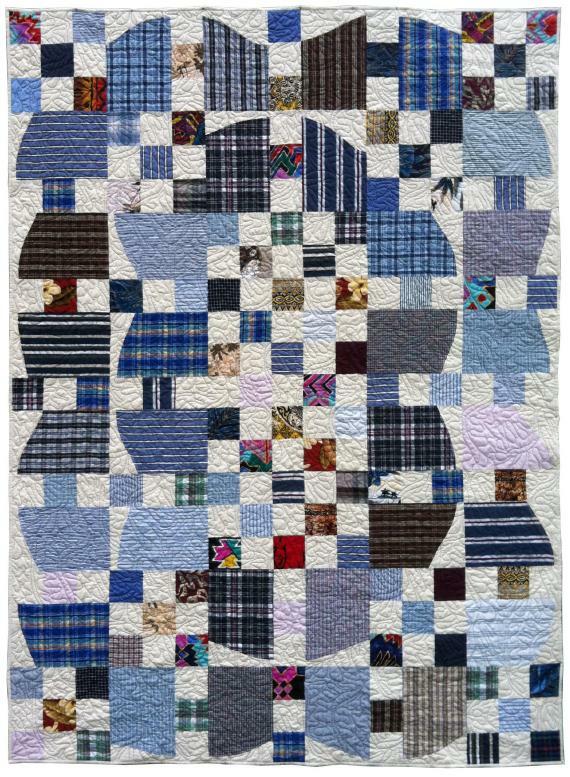 I like the old-fashioned look of this quilt, especially the lighter shirts which mess with the otherwise strong contract. They just fade into the background. It’s been a long time since I used this much muslin in a quilt, and I enjoyed playing with shirting too. I have made several great XXXL discoveries in the shirt department of Goodwill and the Salvation Army. GREAT stripes! Now on to something smaller. Click here to get my blog posts delivered to you via email every time I write one. Sign up for my free monthly newlsetter. I’m also on Facebook and Twitter. Scooter is on Facebook too. Love the quilts, and the photo tips too! 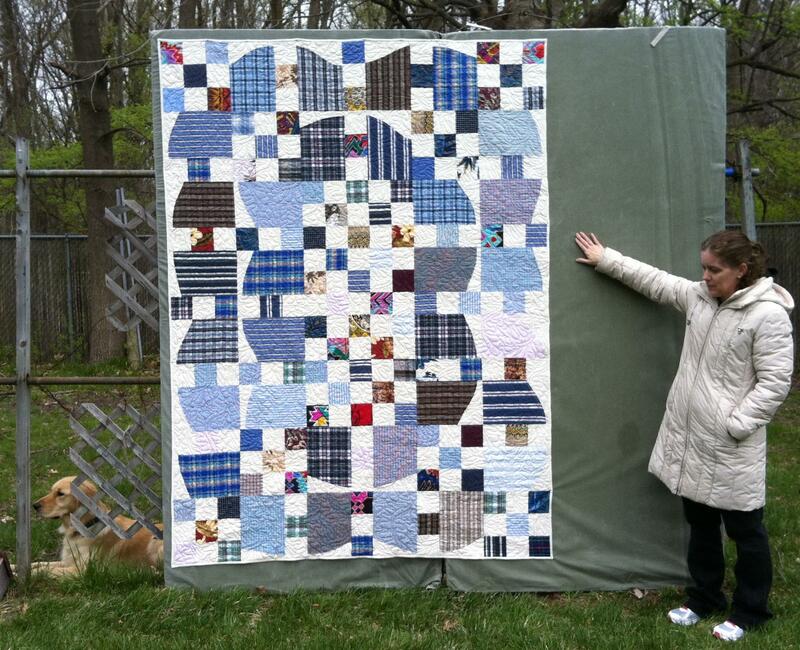 These quilts will be cherished keepsakes, what a lovely tribute and tangible memory. What beautiful, comforting quilts for Mark’s mom – hope they provide her with lots of precious memories! 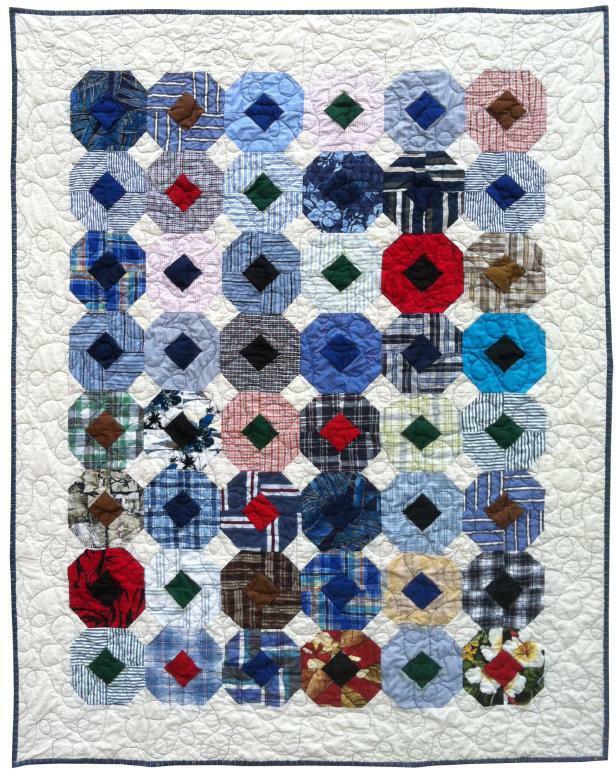 oh Ami, I thought you were just brilliant with the movement in the first quilt, until I read the name , “Shirt Tails”! Of course it was still brilliant, I would have lopped off all the tails and had a boring square block. It is lovely and a perfect tribute to a friend. I can honestly feel the loving warmth you have created. I believe Scooter is the Vana White of quilting. He poses just like Vana by the quilt showing it off to its best. Debbie did a great Vana pose as well. Great tribute! These are definitely loving memories! Oh Ami, what a wonderful thing to do, and a terrific memory! I wish I had been quilting when my darling brother passed away all those years ago, what a great memory these would have been for his wife and son, and my parents. Thanks for sharing, I now have that idea stored in my memory bank (hoping not to have to use it to soon!). I have a plan… None of my DH shirts will ever go to GW or SA again. I believe most of the shirts that have already been sent away had very little wear. They only seemed to shrink just around the tummy area- no where else! That means they had lots of plaid and stripe life left in them. I might even start saving all my Hawaiian shirts. I can make my own memory quilt.